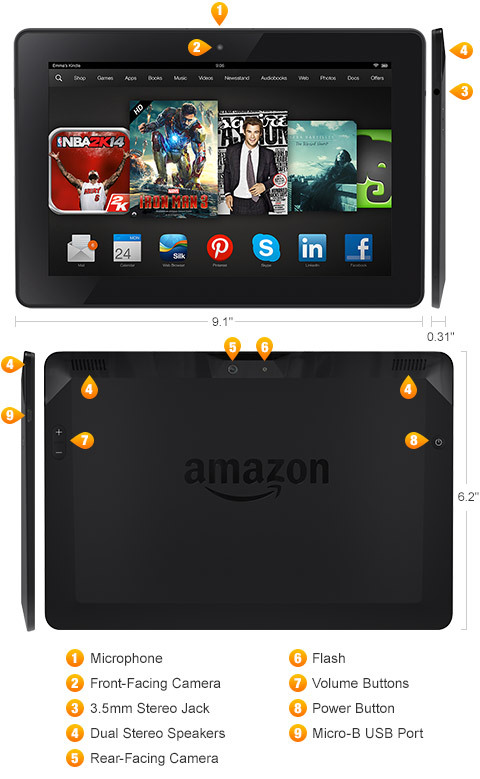 After a few days in which many of us have made our order from the Nexus 7 Google Play come the speculations of the new tablets that Amazon will present to counter. And not only with a new Kindle Fire of 7 inch, If not with one of 10 inch to attack the most important sizes on the market. Today same Amazon, at last, has opened its store of applications Android in Spain, known in our country as Apps store. A movement in which You can start to speculate with the arrival of, at least, some Android device manufactured by Amazon. But we must remember that at the moment it is just an app store and not distributed multimedia content, the great trick from Amazon to sell the Kindle Fire and what has motivated him to get into the market of Android hardware. Rumors and images made by Android tablets come from people of The Verge, quite reliable source. The only image we have allows us to observe proportions strange, very square (4:3) that you differ from 17:10 of the original Kindle Fire. It seems also that Texas Instruments OMAP 4 is abandoned, nailed to the PlayBook, by one more personalized to the requirements of Amazon. The coming week noted as from the filing date of one (or several) Android tablets in the hands of Jeff Bezos. A long-awaited renovation pointing the lack of stock of the current model without view of new orders. There are few days to discover details such as the version of the operating system, knowing that Amazon like you to personalize and even Perhaps we can find a fork of Android (hopefully based already in Ice Cream Sandwich) cooked by engineers from Amazon that not go anything loose on programming issues.